In addition to being functional, golf shoes often complete your outfit. Golf courses require players to wear shoes that will not damage the turf, especially the greens. 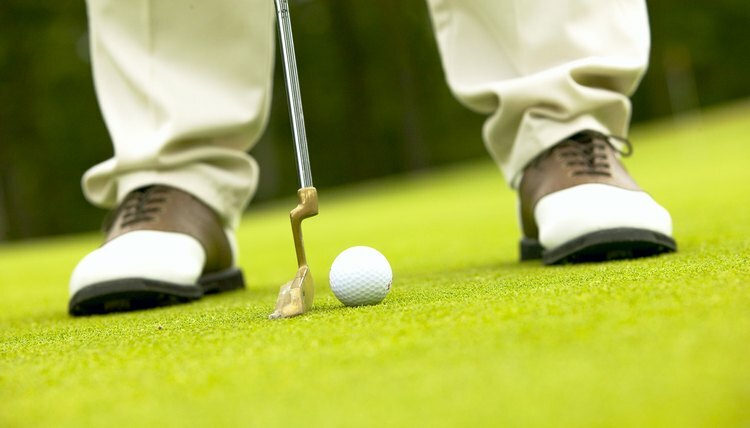 Athletic shoes are usually permitted, but golf shoes, designed for the purpose, can benefit the golfer. The cleats on the bottom of golf shoes help you keep your feet planted during your swing, a feature that is especially important when playing in wet conditions. Without cleats, one or both of your feet could slip during the swing. Some golf shoes have molded grip bottoms rather than removable spikes or cleats. Metal spikes are no longer permitted at most golf courses. Quality golf shoes provide lateral support for the golf swing, keeping your feet stable and providing a solid base for the swing. Golf shoes complete your look when on the course. They're available in a wide range of styles and colors -- from full leather snakeskin to fashionable athletic styles -- so it's easy to match your shoes to your outfit. If you dress traditionally with slacks and a golf shirt, traditional shoes with a brown or black saddle or a solid black are often appropriate. In the past, golf shoes closely resembled dress shoes, which meant they were not overly comfortable for walking. Modern materials and styling have led to dressy styles that provide athletic comfort, or today's golfers can choose and athletic-looking shoe that looks like a running shoe. For a more casual look, you can buy golf sandals with spikes that keep your feet cool during a round. Do Golf Shoes Help You Play Better Golf? Will Golf Shoes Help My Game?